This program will take you for a "Head End" ride in the cab of an M.B.T.A. 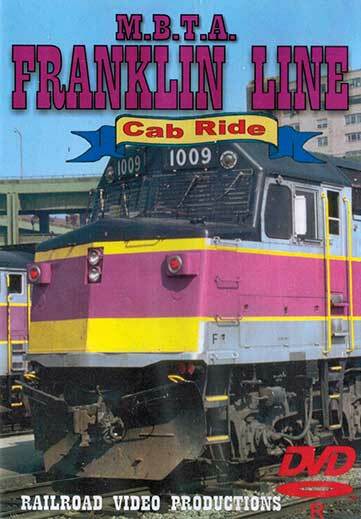 commuter train from Franklin to Boston's North station. In-cab conversation referring to speed, signal indication, location and other points of interest as well as radio communications between trains and dispatcher is provided during the entire trip. You will then see highlights of DVD no. 37 "The Fitchburg Line", no. 38 "The Rockport Line"and several others. Springfield Hot Shots features trackside "Rub-By" action at Springfield, Massachusetts in the summer of 1997. A wide variety of Conrail and Amtrak trains are seen including switching operations at Springfield Station. The entire program was shot and narrated by Tim Hosey. Steamboy (Revere MA US) on 2016-09-01 19:26:18. Ok. while this program was filmed on one day during January 1989, there are lots of changes compare to today's railroading. It has something to do with the electric wires not installed, no silver line bus stop building, and a limited amount of stations.